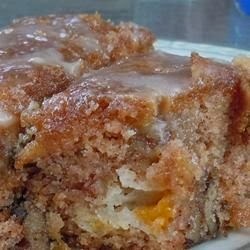 This is a recipe that my mother gave me several years ago, and we enjoy it often. This cake is so good!! I bought some peaches that were too tart for my taste but I didn't want to throw them out so I started looking for a recipe to use them for baking. I wanted to find one that called for ingredients I had on hand. I'm so glad I decided on this recipe. Preheat oven to 375 degrees F (190 degrees C). Grease and flour a 9x13 inch pan. In a large bowl, combine the eggs, sugar, oil, flour, salt, cinnamon, baking soda, peaches and pecans. Mix thoroughly by hand. Pour into prepared 9x13 inch pan and bake at 375 degrees F (190 degrees C) for 50 minutes or until done.